If the node receives a gate signal on the 'G' input, it generates an ADSR envelope on the 'E' output. 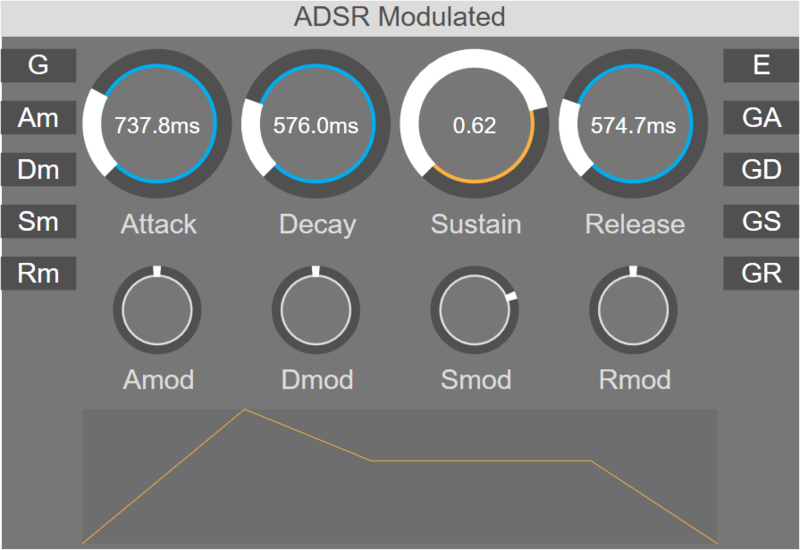 The 'Attack', 'Decay', 'Sustain' and 'Release' values can be modulated and are updated in each computation cycle. The GA, GD, GS, GR outputs can be used to trigger other events during different phases of the envelope. GA: Generates a gate while the envelope is in attack phase. GD: Generates a gate while the envelope is in decay phase. GS: Generates a gate while the envelope is in sustain phase. GR: Generates a gate while the envelope is in release phase.